The Velo-city conference is fast approaching in early June so I’ve been busy arranging meetups and preparing my offerings. I’ll be presenting on One Street’s Social Bike Business program during the Friday parallel sessions. A nice surprise is that I am not the only presenter on bicycles and social issues. That Friday morning, One Street board member Amanda Ngabirano will speak during the plenary session on bicycles in sustainable development. During the Friday session that follows, I’ll be joined by another One Street board member, Michael Linke, as well as other leaders of social bike programs in our session called Pedaling Towards Social Change. You can see the conference schedule here. At least on Friday, I look forward to connecting with many like-minded bike program leaders. On other days, I also see several speakers from developing countries. This gives me hope that this Velo-city will have more emphasis on serving the bicycling needs of disadvantaged people than I have seen at previous Velo-city conferences. 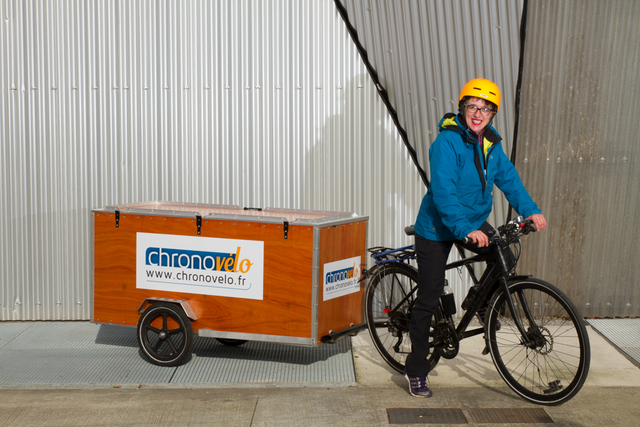 One unexpected and fun encounter at the conference, which I have already enjoyed, is that my Airbnb host in Nantes is Mirella at Chronovelo, a local cargo bike delivery service. That’s her in the photo. She and her company are working at the conference to haul around conference necessities. Pretty cool, eh? One month and I’ll be on my way to Nantes! Oui, Oui!